Burnside Cottage is a lovely traditional two bedroom cottage, that sleeps 4 people and is situated in the village of Broadford at the south end of the island. The cottage has quite a spacious kitchen/dining area with an electric cooker, microwave, fridge freezer, washing machine and tumble dryer. There is a washing line in the large garden (pegs supplied). 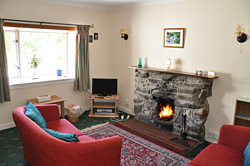 The sitting room is comfortable and cosy, boasting an open fire and traditional built stone fire place. For entertainment there is freeview TV, DVD player as well as a portable radio and CD and cassette player. 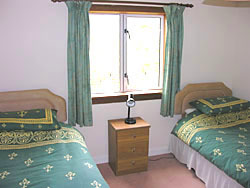 The bedrooms consist of a double bedroom and a twin room. 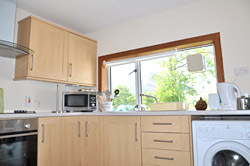 The double bedroom has views over the garden to Beinn na Cailleach and the Red Cuillin. For smaller members of any family a travel cot is available on request. The bathroom has a bath and an overhead electric shower. 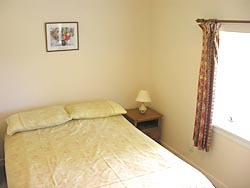 All bedding and linen is supplied as are hand towels in the bathroom and kitchen as well as dish towels. Please bring your own bath towels. We are sorry but we cannot accommodate any pets in Burnside Cottage.